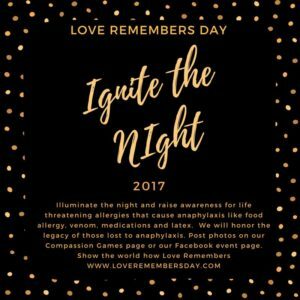 Today starts the firs day of Love Remembers Day (or weekend) started by Aleasa Word through her Compassion 4 Anaphylaxis campaign. She is an amazing woman, fellow food allergy Mom, an emotional intelligence coach and as if that weren’t enough, the woman can SING! She is also a strong advocate for those with all kinds of allergies. Through her work which includes Flowers 4 Anaphylaxis and follow up support for those families who have had to deal with the unthinkable, she has touched the lives and hearts of so many. Her work in our community make her such an asset! Please take some time this weekend and consider some of the suggestions Mz. Word has pulled together. I thank you, Aleasa, for all you have done for our community. You are one in a million, a fierce advocate for your own family and all those with allergies and I am grateful to have the pleasure of knowing you.